YOU DO NOT HAVE TO COMPLETE THIS FORM ENTIRELY. IF YOU PREFER, YOU MAY GIVE ONLY YOUR NAME AND PHONE NUMBER OR EMAIL ADDRESS. LATER, SMP MAY NEED ADDITIONAL INFORMATION IF WE ARE TO ASSIST YOU. 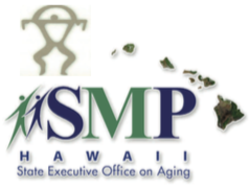 SMP HAWAII WILL NOT CONTACT THIS INDIVIDUAL OR BUSINESS WITHOUT GETTING YOUR PERMISSION FIRST. THE INFORMATION ON THIS FORM WILL BE TRANSMITTED SECURELY TO SMP HAWAII AND WILL ONLY BE SEEN BY SMP HAWAII AND LAW ENFORCEMENT AUTHORITIES TO WHICH SMP HAWAII MAY REFER YOUR COMPLAINT FOR FURTHER ACTION.